Many stars have played for the Colorado Rockies, but none have really taken the hobby by storm. 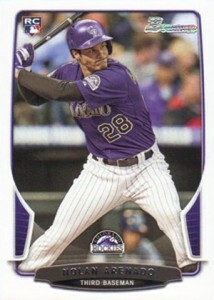 Nolan Arenado rookie cards and other cards aren't there yet, but he has quickly developed into one of baseball's top third basemen. A rookie in 2013, Arenado was a Gold Glove winner at the hot corner. He followed that up with another one in 2014. While Arenado's first couple of years were stellar in the field, things were largely unspectacular at the plate. That changed in 2015 where he has been one of the National League's top run producers. He set career highs in both home runs and runs batted in before the All-Star break. From a collecting standpoint, the Rockies don't get a ton of widespread respect. There's the belief that the thin air inflates numbers. The lack of national attention doesn't help either. With Arenado tearing things up right now, values for his cards have risen to new highs. That still doesn't mean much for his lower-end rookies and prospect cards. However, his 2010 Bowman Chrome autograph is moving at a faster rate. 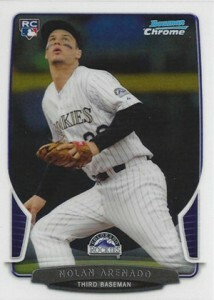 The first Nolan Arenado cards came out in 2009 from Donruss and TriStar. Topps included his first MLB cards in 2010 Bowman as part of the Prospects and Chrome Prospects inserts. 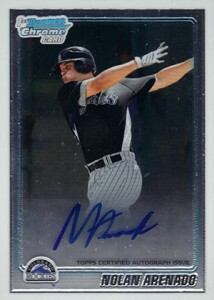 The product also has his first autograph card in a Rockies uniform. And while he had lots of cards released before his MLB debut, Nolan Arenado rookie cards can be found in a handful of 2013 base sets. 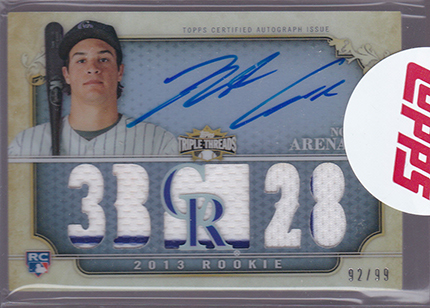 The following is a list of Nolan Arenado rookie cards released in 2013 base sets. It doesn't cover inserts. 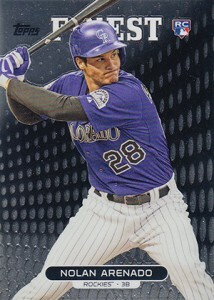 Called up too late to get into the 2013 Bowman set, Arenado made the cut for the late-season release. This is a simple card and considered to be one of his cheapest rookies. Although a little more fancy than the Bowman Draft card thanks to its chromium stock, this is still very affordable. Even though it might not have the rookie label, collectors gravitate more towards the 2010 Bowman Chrome Prospect insert. Those looking for color and rarity can chase the Refractor rainbow. 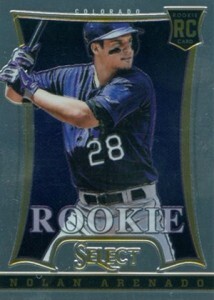 While the price might not reflect it, this is one of the hardest Nolan Arenado rookie cards to find. The product is loaded with autographs. And even when you pull a base card out of a pack, it's just as likely to be a Refractor parallel. Panini's answer to Bowman Chrome, Prizm has a heavy chromium feel. Like Bowman Chrome, it also has a lot of color-based parallels although some add patterns to the mix as well. Panini brought back the Select brand to baseball to add another chrome-style set to their portfolio. The set didn't do so well. 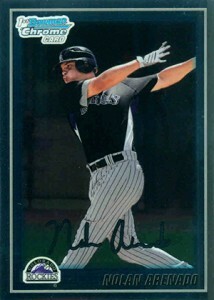 A lot of rookies in the set have autographed cards but Arenado isn't one of them. Given these used stickers that don't look great when mixed with the metallic stock, it might be a blessing in disguise. 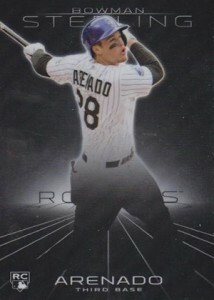 Arenado's spin with the flagship Topps design can be found in Update Series. It's about as basic as it gets, and cheap too, but it should get added recognition over time because of the tradition behind the brand. Even still, there are plenty out there and prices should never be out of hand. 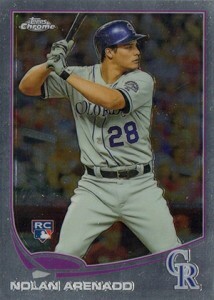 Yet another chromium-based rookie card for Nolan Arenado, the base version is very affordable. Besides the regular mix of Refractors, there's also an on-card autograph in the product that uses the same basic design but a different photo. With its scoreboard-like design and a release date that was close to both Topps Chrome and Bowman Chrome, 2013 Finest got lost in the shuffle. Response for the design is mixed with a leaning towards the unpopular side. Arenado doesn't have a basic autograph in the set like a lot of the other rookies, but he does have an autographed relic. Included in a box set that was initially available as an online-exclusive, singles of this card are a little harder to find that many of the third baseman's other rookies. But after the wild success of the 2012 Heritage High Number set, the production run here was much higher. 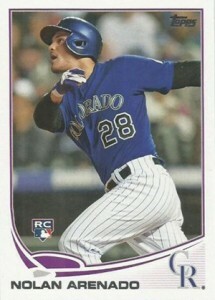 As far as Nolan Arenado cards that carry the RC label, this is the one on the highest end of the scale. Numbered to 99 it comes with both an autograph and memorabilia. The card was inserted in packs as a redemption. 2013 Topps Update Blue #US259 Nolan Arenado Rookie Card GMA 10 Gem Mint! 2013 Topps Chrome #78 Nolan Arenado Rookie Refractor GMA 10 Gem Mint! 2013 Topps Update Nolan Arenado PSA 9 MINT NEW LABEL #US259 ROOKIE CARD RC HOT!! The following list highlights some of the most popular Nolan Arenado cards released before his MLB debut and his rookie cards. Beating Topps to the punch doesn't necessarily carry over into bigger values for the 2009 Donruss Elite Extra Edition Nolan Arenado autograph. Not being licensed is a turnoff to some. The signature is also on a sticker. No matter the reason, this card sells for about half that of its 2010 Bowman Chrome counterpart. It's clearly less desirable to many but for those simply looking for an early autograph over future gains, they might see it as a bargain. TriStar also got autographs out before Bowman Chrome. Unfortunately, the company doesn't garner much attention for their baseball cards. As a result, it doesn't draw much attention or carry much value. 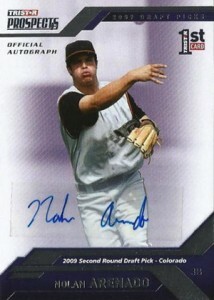 If the autographed version isn't in your budger, the 2010 Bowman Chrome Prospects Nolan Arenado is a great place to start. Not rare and not overly pricey, this and his basic Bowman Prospect inserts (both included in 2010 Bowman Baseball), are his first to feature Arenado as a member of the Rockies. Seeing as how both are inexpensive, the premium feel of the Bowman Chrome version is preferred by most over the paper Bowman card. 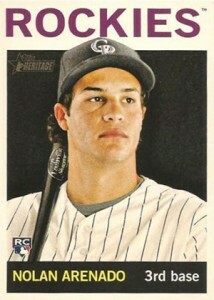 No, this isn't a Nolan Arenado rookie card by definition but it's his cornerstone card. Like a lot of current players, his first Bowman Chrome autograph is his most highly sought after card, at least out of those that are widely available. Beside the basic version, it has several serial-numbered Refractors. Much like the Bowman Sterling rookie card that came three years later, the appeal of this one is its rarity and overlooked status. 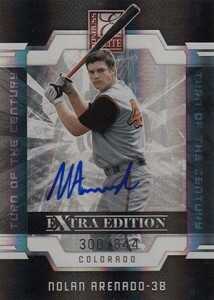 It's also a little more slick than the base Bowman Chrome card from 2010. 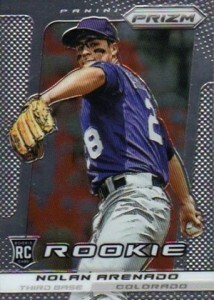 Lot of (4) 2011 Bowman Draft NOLAN ARENADO Topps 100 Prospect Rookie RC ROCKIES! 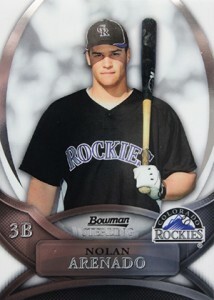 Hi, looking for a 2010 Nolan Arenado Bowman Prospect Red card, have any leads?